Wandering through the Kerrytown Farmers Market, I happened upon a produce table that I enjoy patronizing : Green Things Farm, their produce cultivated on an organic Nixon Road farm in Ann Arbor Charter Township. I love the name, as full of whimsy as a child’s story book, and purchased a bunch of curly-leafed lettuce, thinking of the frilly lime-green petticoats a garden nymph might wear in the book I was imagining. I wondered how to highlight the lettuce in a recipe, thinking of the potluck birthday party I was planning to attend. Lettuce cups, heavy with the bite of protein-rich shrimp dressed in a Green Goddess salad dressing, popped into my head. Surrounded by so many “green things” while caught in a fanciful mind-set, it sounded like the perfect answer for a late summer evening nosh. Green Goddess salad dressing is reminiscent of that fine-dining era of meals served by tuxedo-clad waiters to the background swells of Benny Goodman. Your dinner might begin with a wedge of Iceberg liberally doused with Green Goddess, followed by a baked potato (butter and sour cream non-negotiable), filet mignon (rare), and a Gibson (straight-up and dry). The Green Goddess dressing would have typically been made with chives, anchovy and lemon juice — lusciously heavy on the sour cream and mayonnaise. I’m a people-pleaser, and when cooking for friends, my experience has been that full-fat whatever will always be gobbled up well in advance of, for example, a vegetable platter. In a Green Goddess dressing whole fat (preferably homemade) mayonnaise and sour cream tastes better to most, than would a substitution of fat-free yogurt. But I’m always on the lookout for ways to increase nutritional components, and decrease saturated sugars and fats, without sacrificing flavor. I decided to take a different approach to this classic. Desiring the herbaceous, rich, full flavors of Green Goddess dressing with a less dense, more nutrient-rich composition, I thickened the dressing with avocado — a nutritionist’s darling — eliminated the sour cream, and reduced the mayonnaise. 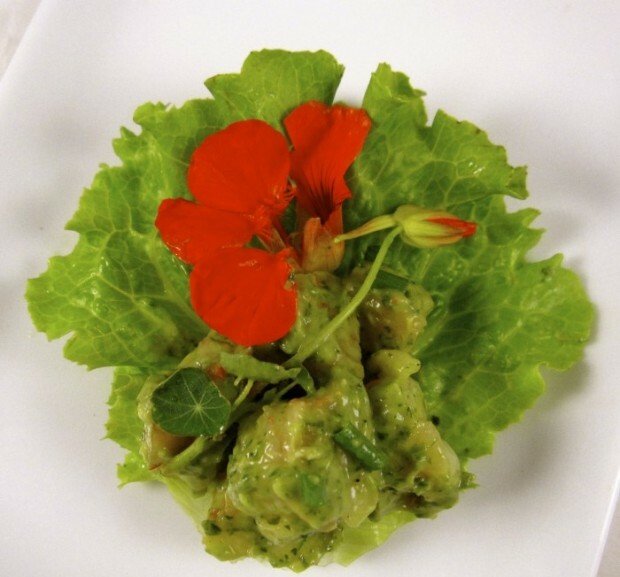 The avocado enhanced the lime color of the dressing without sacrificing the richness of flavor, and silkiness of texture. If you’re scanning the recipe and stop, nose wiggling, at the thought of those hairy wiggly critters you see on pizza, I beg you to reconsider. Anchovies are a flavor-packed, briny component in the dressing, and I’ll bet you wouldn’t even know they were in the ingredients if you didn’t read it below. If you like Worcestershire sauce, you like anchovies, which are one of the main ingredients in the condiment. Anchovy lends complexity and depth to world cuisine, and in the recipe below, as well. The salad also finds a comfortable home served in a partially scooped-out tomato, or in a pitted avocado half, shell intact. Bring a large pot of water to a boil and season with Old Bay. Cook shrimp until just cooked through and drain in a colander. When cool enough to handle, peel and devein, if necessary, and chop into bite-sized pieces. To make the Green Goddess Dressing, scoop avocado flesh into a food processor and add parsley, tarragon, chives, 1 teaspoon garlic, anchovies and lemon juice. Process until well-combined. Add mayonnaise to bowl and process until combined with herb mixture. With a spatula, scrape mixture into a medium-sized bowl. Stir shrimp into dressing and season with freshly ground pepper and additional garlic and kosher salt, if needed. (The anchovies and shrimp add enough sodium for my palate.) The salad may be made up to 18 hours at this point, prior to filling leaves. Just before servings, spoon into lettuce cups and serve. * I used Trader Joe’s Uncooked Wild Blue Shrimp (colossal; under 15 count). A bit of flavor is sacrificed as the shrimp are pre-peeled and deveined, but time saved may be worth it. I never buy cooked shrimp; I find them watery and lacking flavor. **I never use fat-free mayonnaise but often use Hellman’s Light — not as delicious as full-fat, but best in class.